It seems like now days we are even busier than when the kids were in school. Most days I feel like I met myself coming and going. And it's only a few weeks into summer vacation. Thankfully there are ways to help with that like Fruit Me Up! Boost. It's a natural snack that gives you a nutrition boost any time of the day...and even on the go. I like that they are shelf stable so I can toss a pack into my bag when the kids and I are headed out for the day to run errands. Then when we need a pick-me-up we have something handy and it helps keep us away from fast food restaurants and drive-thru food. Which we all know is hard not only on the pocketbook but also on our bodies. Fruit Me Up! Boost is made with all natural ingredients and has all lots of nutrients our bodies need. Of the flavors I've tried so far I think the peaches and cream are my favorite. It kind of reminds me of a peach pie at room temperature. Fruit Me Up! pouches are made with real fruit and real ingredients, providing kids with convenient natural energy, mess-free! 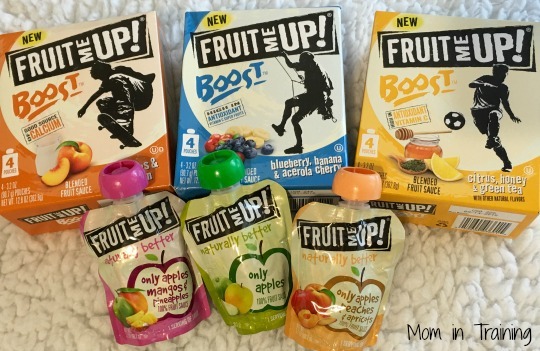 The pouches are available in two varieties - Fruit Me Up! Naturally Better and Fruit Me Up! BOOST. Fruit Me Up! Naturally Better pouches offer a full serving of fruit, contain no added water or fruit juice concentrate and have 25% less sugar per oz. than most leading brands. Each Fruit Me Up! BOOST pouch offers an extra boost of nutrients like calcium, fiber, antioxidant Vitamin C and Omega-3 ALA in every delicious flavor combination. Connect with Fruit Me Up! on Facebook. Buy it: You can purchase Fruit Me Up! at select retailers in store and online.